High quality, very soft rug. Colors are true to website image. Base color of rug trends more cream/ivory but easily pairs with white furniture. 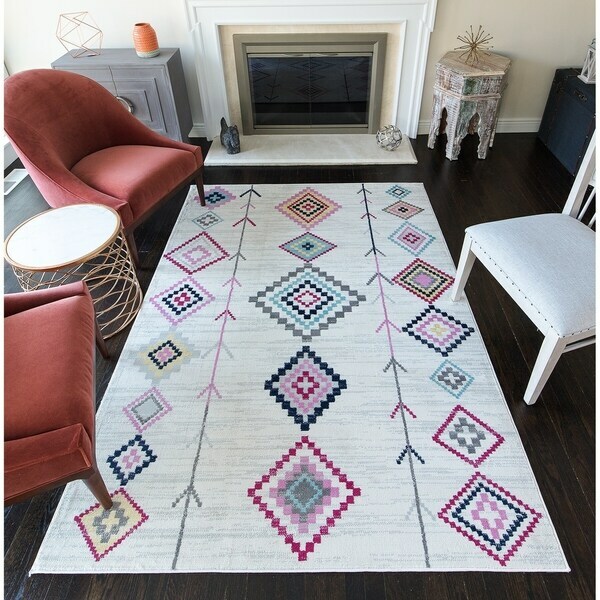 From its soft-touch polypropylene fibers to its ultra soft, nearly half-inch thick pile, the Mert area rug has a texture that makes for happy feet. A striking, geometric motif designed with bold shades of pink and blue is beautifully countered by an off-white background. This is the softest rug we have ever owned! It goes perfect in our daughter's room and is high quality. The colors are vibrant and the rug "trained" very quickly. We didn't even need a rug pad or anything underneath to keep it in place and the corners/edges down. What a fun rug! I'm using this in my bedroom. The colors are a bit brighter than the picture but I'm finding it doesn't matter. It all balances out with my other furniture. The rug itself is super soft and has a very low pile. It feels really good under your feet! This rug is super soft and feels nice on your feet. Highly recommend! Love this rug. We purchased this rug for our master bedroom and it was perfect. Super soft, great color combo that is pleasing and warming to a room. Nice rug for my bedroom. The mostly white design helped lighten up the room. Plus I liked that the rug’s diamond pattern wasn’t overly busy. Love this rug. I had another one in mind. but the price wouldn’t go down. So I went with option B, and I couldn’t be more pleased. I had got some pink curtains from target and this has so many different options it just fit so well.. Thank you OS for this beauty. The rug looks great in my bedroom. True to the photo. Great colors. 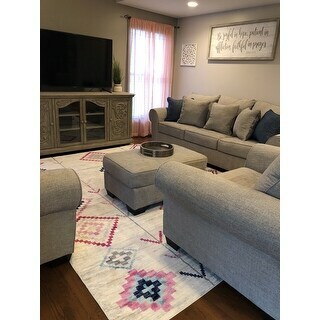 Purchased this rug for our new baby girls room! It was a great and price and included a lot of the colors we wish to use in her room. Lots of pinks and blues which works perfectly for us. The pattern isnt super busy so it doesn't over power the room. I bought this rug for my daughters room and it is perfect! It’s very soft & great quality!